Paeonia Dynasty is a wonderful, pastel coloured peony with a lovely fragrance. Although it’s relative new to the market, this variety already has gained a lot of popularity. It’s not hard to see why: Dynasty has nice, large buds and an unique combination of colours after blooming. Paeonia Dynasty is a double-flowered peony that blooms in the shape of a rose. This variety is known for its stunning colour gradient. The outer petals are pale pink, the inner petals in the centre of the bloom are pastel cream. An unique characteristic that she shares with Pastelegance and Summerglow. Little is known about the origin of Dynasty. Any tips? Let us know! You’ll have our eternal gratitude. 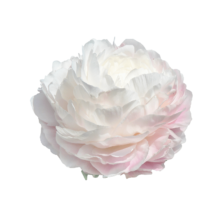 Dynasty is available only for a short time during the latter part of peony season. This variety is exclusive and in demand, so order in time if you’ve set your sights on this lovely peony!